Gessling's antics drew angry rebukes from politicians, a lifetime ban from the Missouri State Fair and more personal hits than he ever faced in the ring. "I've had one lady spit in my face - called me a dirty name, spit in my face and walked off," Gessling said. And he says there have been five death threats. "I've had somebody threaten to run me over. One of them wanted to burn the house down," he said. Gessling says that hate is actually what finally brought him out to speak. "I didn't do this to do any hating on anyone. I did this to be funny. I did it to be a joke," Gessling said. He is a person and he has a name! Tuffy Gessling. His story is compelling. The intolerance of the tolerance crowd is stunning! Back when this story first came out, I posted this on another Forum: "Thou shalt not mock the Führer!" The intolerance of the tolerance crowd is fascist...plain and simple. At the heart of every Liberal is a totalitarian waiting to get out. I still think the hypocrisy in this whole thing is breathtakingly stunning. 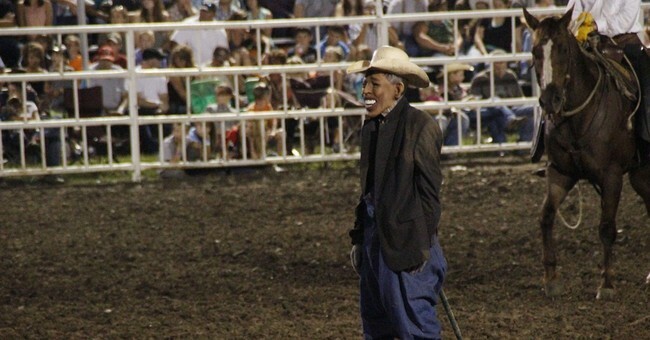 Does anyone remember back when Bush 41 was pres and a rodeo clown wore his mask in the ring? The response from the left was nothing but hilarity. (And I haven't even mentioned the repulsive stuff done to Bush 43). So yeah I think Rev has it right: intolerance = pure fascism. It takes everything in me to even read the news nowadays, I am so disgusted.